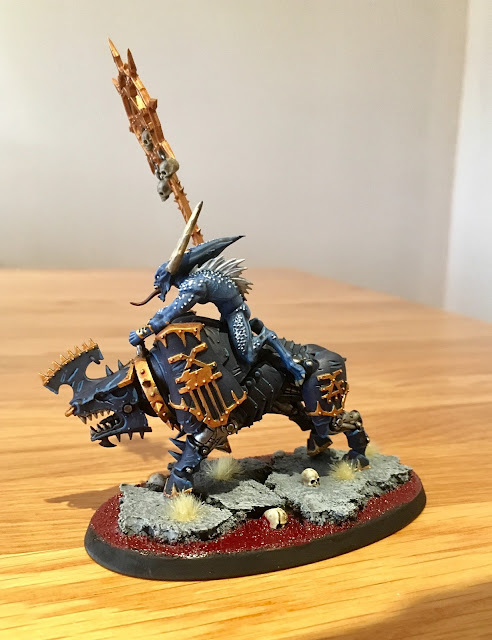 I am joined today by James Chalmers from the Tales of Sigmar podcast, I have been watching the progress of his Khorne Daemon army for Realm Hoppers and really got involved in it. 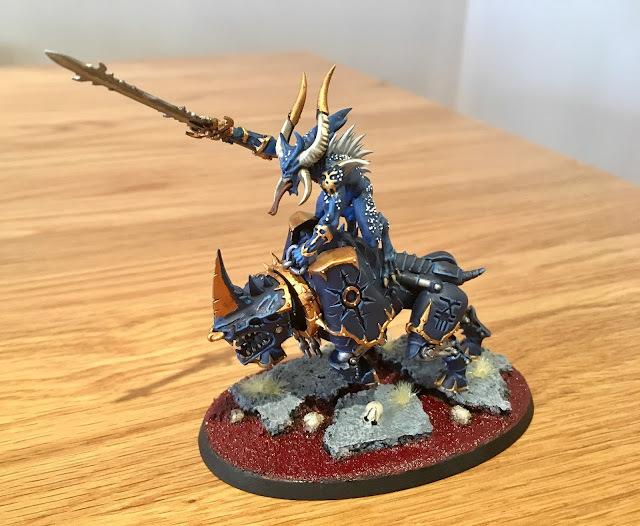 I could have picked any of his units for todays showcase, but i have picked out the Bloodcrushers as it has every aspect of what he has achieved. So without further ado, below is the conversation I had with him. Sean: Hi James, how the devil are you? James: Very well thank you and thanks for having me. 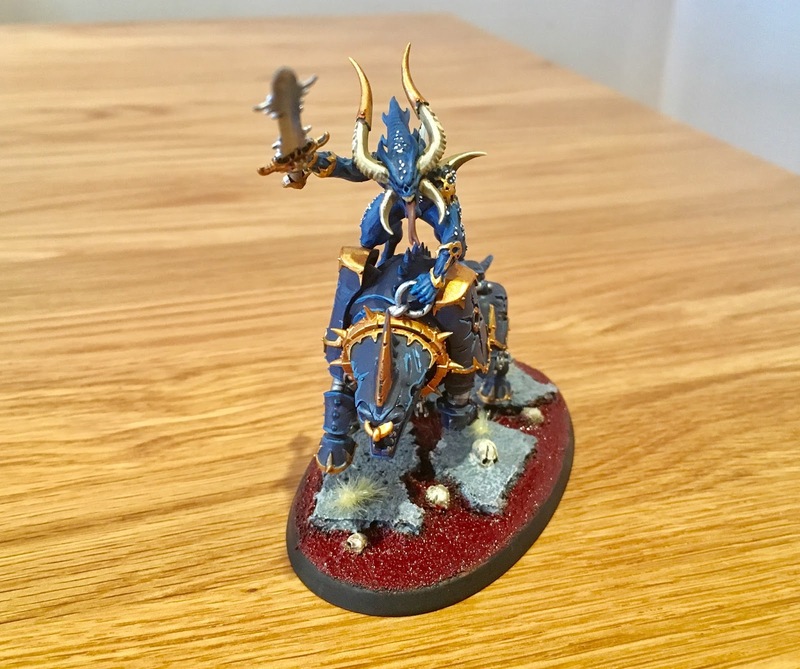 Sean: I have wanted to do a showcase with you for a while now and after seeing your blood, sweat and tears going into the Khorne army, I thought it was a perfect opportunity. So firstly, Why Khorne Daemons? James: Honestly, it’s the big models that Khorne have. I’ve always wanted to have Skarbrand and the Bloodthirster models so this was the perfect opportunity to pick them up. 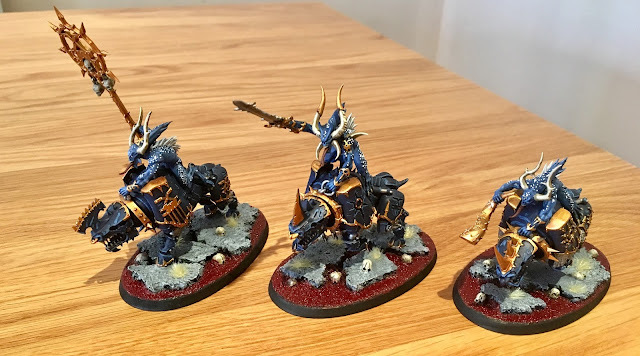 With the Realm Hoppers narrative event it meant I could really invest into the Chaos models I wanted to without having to go down the whole ‘net list’ of hordes of Khorne models. Sean: If anyone has seen the build up campaign to the Realm Hoppers Event, they would have seen the fluff you have created for this army. Have you ever done anything like this before for your armies and what has given you the inspiration? James: I’ve never done anything like this for wargaming before. I used to quite enjoy doing creative writing but haven’t done it in many years. 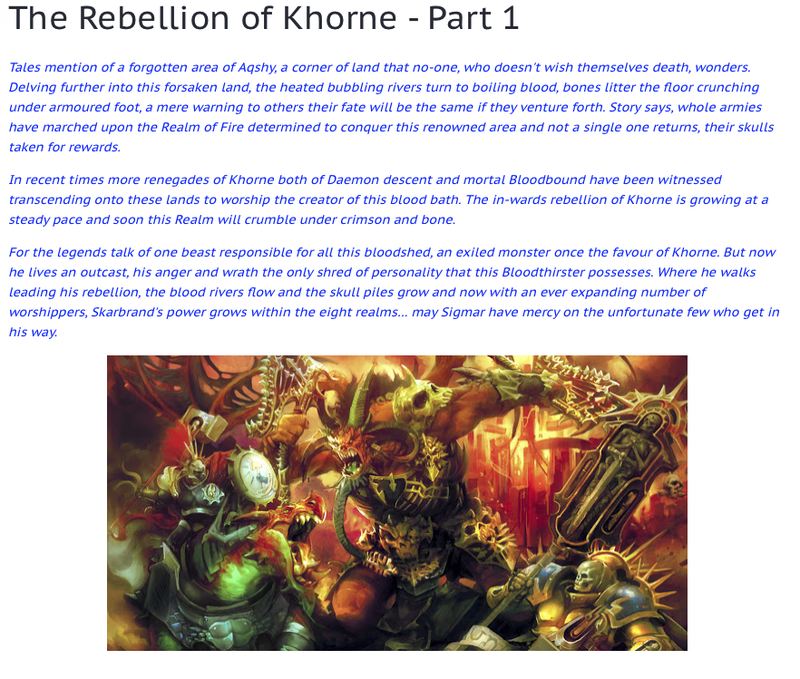 The thing about Narrative play in Age of Sigmar is that you can really get into a story created by you the player. With the game being still in its infant stage and a lot of the lore in AoS being so ambiguous at the moment it gives people so much scope to forge their own narrative. 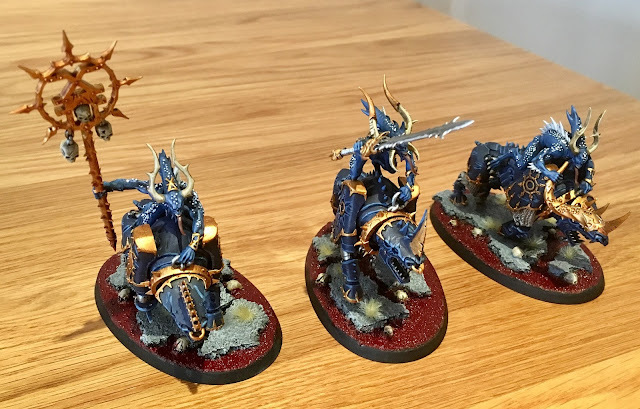 I really wanted to get involved in Realm Hoppers and give my army a good background story and explanation on why they were blue. It would’ve been too easy to just say their red Khorne Daemons looking for skulls and blood, but why not have a Khorne Rebellion that’s led by The Exiled One Skarbrand? 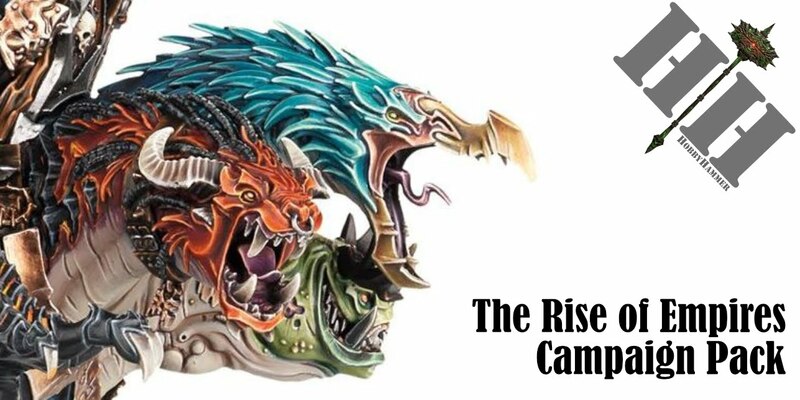 That to me is a much more interesting story to tell and gives you the chance to bring totally random models into the army, in my case the Forgeworld Skin Wolves and Giant Chaos Spawn miniatures. Sean: The most distinctive thing about your Daemons are that, well they’re Blue! It is so striking. What made you go with Blue? James: I hate painting red! For some reason it’s one of them colours I struggle to paint on big areas, I find I just cannot get the right levels. But I quite like doing quirky colour schemes, my destruction army for example all have icy blue skin and purple armour. I find having a unique looking army doesn’t mean I’m comparing my work against others who have gone for more traditional looking paint schemes. Sean: What is your recipe for painting the Skin of the Bloodletters? James: Lot of blue! I start with a black undercoat, then use the base paint Kantor blue over the whole model, after that I use another paint but this time the Caledor Sky blue, this goes over everything bar the crevices to leave the darker Kantor showing. I then wash the whole model using Drakenhof Nightshade to dull down the bright Caledor. I stupidly then decided to pick out all the dots and the fins on the Bloodletters skin using Vallejo Sky Grey (this takes a ridiculous amount of time and after doing 40 Bloodletters never want to do it again!). Finally it’s Zandri Dust on the horns on the heads, an Agrax wash and then a simple line highlight of Ushabti Bone. Once that’s all done I do one final highlight over all the raised parts of the skin with Alaitoc Blue. 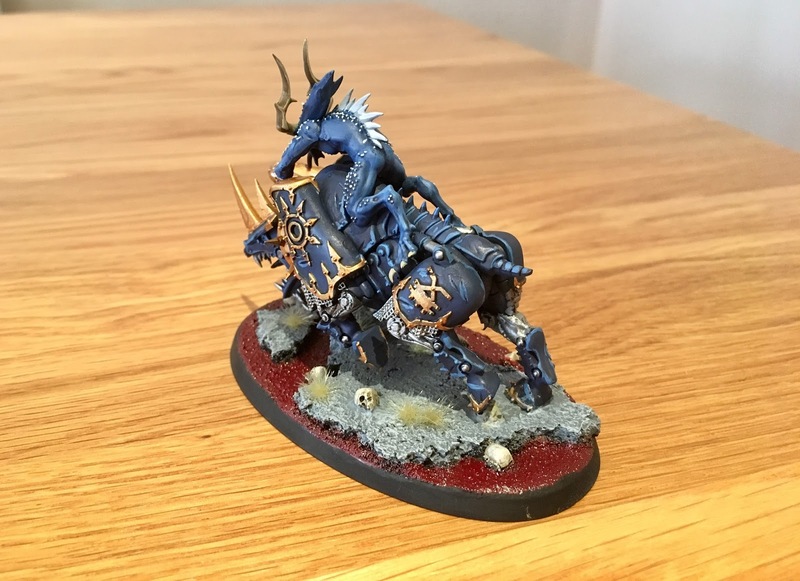 Sean: The Blue really contrasts nicely with the Blood on the bases, if you could do a simple GW paint splatter for the bases how would it go? James: The bases are really simple to do but effective. The rocks are just cork floor tiles broken up. They’re base coated in Mechanicus Standard Grey and then drybrushed with Administratum Grey, I then use the GW Mordheim dead grass tufts on the rocks. The skulls are the same as the horns of the Bloodletters, Zandri Dust, Agrax wash and then Ushabti drybrush. The blood is pretty simple, I paint the base with Vallejo Hull Red and then do two layers of the Blood for the Blood God paint and that’s the lot. It’s a simple scheme but really works well across the whole army. Sean: I also love the metallics you have achieved, how do you go about doing metallics? James: The metallics are probably the easiest techniques I’ve done on these models, for the gold its using a basecoat of the fantastic GW Retributor Armour base paint, a Reikland Fleshshade wash and then Liberator Gold on the very top edges. For the silver in the weapons it’s literally Leadbelcher base, a Gloss Nuln Oil wash and then Runefang Steel on the edges. The new gloss wash is great, it really helps keep the metallic shine while shading the weapons. Sean: So onto your podcast, you are one of the 3 hosts of the Tales of Sigmar podcast, what you got planned for the podcast this year and what made you start it up? James: To be honest it was after listening to the likes of Facehammer, Age of Sigbrah and Black Sun I thought it would be cool to talk Age of Sigmar too. There wasn’t really anyone around my way who do events/talk AoS that much so I just randomly put out a tweet about considering doing one and that’s when Dan and Adam both said they’d be interested. It’s been great fun, although I’ll admit it’s been a little disjointed with our personal lives getting in the way of recordings at times. The problem is we’re all scattered over the country so we need to coordinate Skype calls when we’re all free. The main plan this year is to hopefully have a lot more frequency to episodes with an actual schedule, but we’re going to be looking at doing some more interviews with members of the community as well as covering events and battletome releases too. 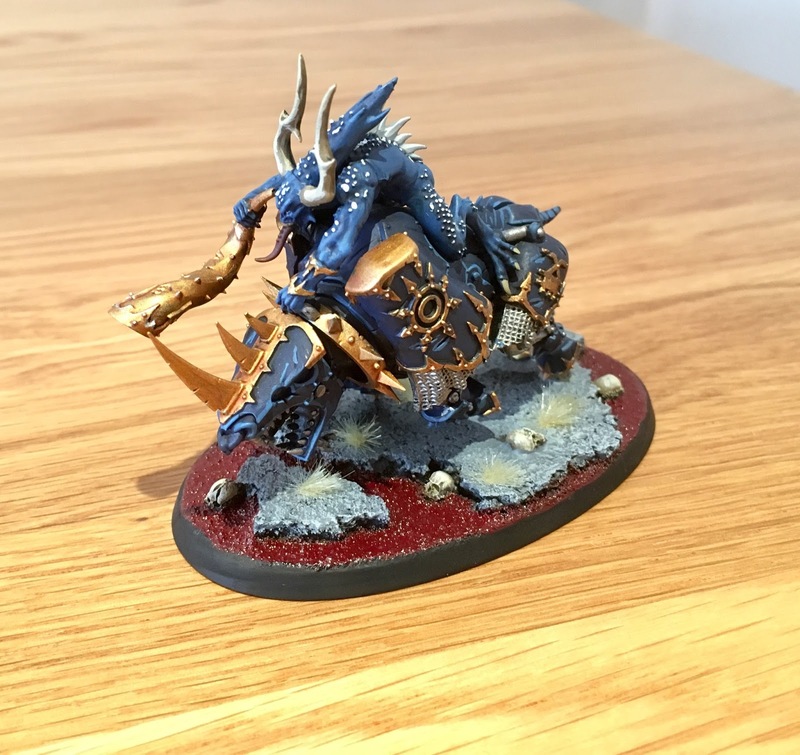 Sean: We crossed paths online about a year ago when you started the Tales of Sigmar painting motivation blog, which really helped me and loads of others. I see you have one on TGA now, how is that going? 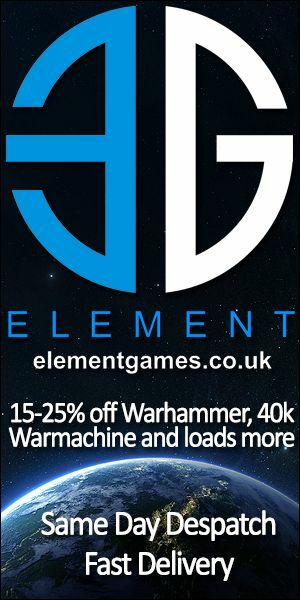 James: Yeah I was always a fan of the Tale of Gamers articles in White Dwarf, where you have a budget and you’ve got to build up your army over a few months. I wanted the blog to be something along those lines but also a way for people to find the motivation to keep painting. I normally fall in the same trap as others where I’ll get distracted by new releases and my current project gets halted. We’ve had some great efforts in the TGA thread, though like a lot of these projects the numbers do dwindle after a while which is understandable. But we’ve still got a great batch of people who are using it as motivation to paint a set amount each month. The great thing with TGA is that the community is really getting together to help people get painting. There’s the painting contract thread, where you say your committing to painting a certain amount of models each month, and most recently the 1K army project which is great to get a Vanguard army built and painted. Sean: What is the AoS scene like in your area? James: It’s a work in progress. When AoS dropped the Fantasy scene did basically die in the North East. A couple of people tried AoS but hated the original iteration of it which I think has tarnished it a bit. I’ve continued to play along with a few friends and we’re still loving it, I’ve actually started a new Wargaming Group in Newcastle called Newcastle Warlords. We’re currently starting a slow-grow league there to introduce the game to people starting at 250pts and increasing by that amount each time we play the league games. The first night a few days ago we had 19 players turn up and all put their initial 250pts on the table and just had a big fight for 4 objectives! It was great fun and if we can keep those 19 people involved the club is going to hopefully be the AoS club in the North East. Sean: What events have you got planned to attend this year? James: Well Realm Hoppers for one which I’m obviously very excited to attend, even if it’s going to take 6 hours to drive down to! I’m hopefully going to Heat 2 of the Grand Tournament at Warhammer World (if I can get a ticket) and planning to attend Facehammer GT at Element Games at the end of September which was amazing last year. 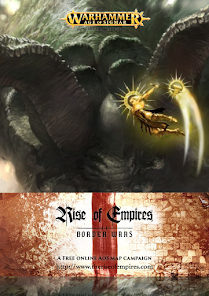 Other plans include Realms at War 2017 and the Rise of Empires: Border Wars events but those are dependent whether I’ve earned enough renown and can get the permission slip signed! I’m also running the first Age of Sigmar matched play in the North East on June 17 called Summer Massacre. I was surprised that it Sold Out in less than a week which is great, but shows you how much the scene is growing if a 24-Player event in the North East of England can sell out that quickly. So yeah lots of planning and organizing needed for that in the coming months. Sean: Any final thoughts and anything you wanted to plug? James: I just want to plug all the great work people are putting into AoS on the TGA forums, it’s great to see so many new projects and ideas being formulated there. But also if your based up in the North East, Newcastle Warlords and finally give a listen to the Tales of Sigmar Podcast. Sean: Cheers for the interview dude and see you soon! James: Thanks for having me! See you at Realm Hoppers!